Norwegian state railway NSB has started rolling out its new trains called “Flirt,” and they seemed generally well-received. The trains are part of a major upgrade of Norway’s long-troubled rail system, and more will be put into service in the coming months. The first new Swiss-built train, which rolled out of Oslo’s central station last week amidst music and fanfare, was put into service on the route between Oslo and Skien, south of the capital. More new trains will run on the continuation of the route, north to Lillehammer. Lundeby said there was no intention of discriminating against residents of Hedmark and Oppland counties, where Lillehammer is located, and noted the trains’ maintenance base lies in Skien. “So it was because of practical reasons that we’re beginning with the Oslo-Skien route,” he said. Introduction of the Flirt trains was delayed when one of them ran off the tracks while on a test run near Holmestrand. An investigation determined that the accident had nothing to do with the train itself, but rather was blamed on human error. Reviewers on board the first runs described the new trains as quiet and fast, at least when tracks allow speeds of 200 kilometers per hour. The interiors were reported to be spacious, but the seats narrow compared to the older trains. Newspaper Aftenposten described them as a compromise between local commuter trains and regional trains that offer more comfort. They’re built by Stadler Bussnang AG of Switzerland and NSB has invested around NOK 4 billion in them. 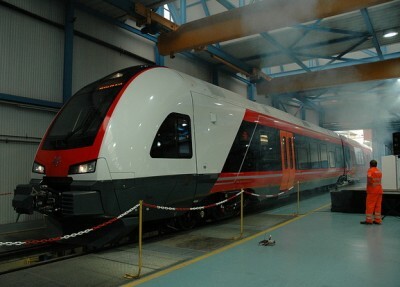 The state railway has ordered 50 new trains of the Flirt model, which stands for “Fast Light Innovative Regional Train.,” and NSB has an option for 100 more.